Irritant contact dermatitis is the name for skin that becomes red, itchy, painful and inflamed when it comes into contact with a particular substance (an irritant). When your skin is inflamed it dries out and you produce less of the oils that normally help to protect to your skin. As a result your skin is even more sensitive if it comes in contact with the same irritant again. Sometimes this happens the first time your skin contacts an irritant, for example after touching a strong chemical. However, it usually happens when you regularly come into contact with an irritant, for example you may often put your hands in water or use certain cleaning products. Irritant contact dermatitis usually affects people's hands, but can affect any part of your skin that comes into contact with irritants. 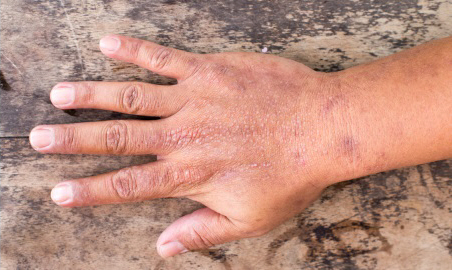 People who already have eczema or sensitive skin seem to be more prone to getting this condition. It is also more common in people with certain jobs, such as hairdressers, cleaners, healthcare workers, and caterers. If it's obvious what is irritating your skin you won't need any tests. However, if it's not clear what is causing the problem, then you might be referred to see a dermatologist (skin doctor) for patch testing. Patch testing is used to check if another condition, called allergic contact dermatitis, is causing the rash. Allergic contact dermatitis happens when you come into contact with something you are allergic to. During a patch test small amounts of several possible irritants are put on your skin (usually on your back) and covered over with a dressing. After a couple of days these dressings are removed to check which substances have caused an allergic reaction on your skin. You can read more detailed information about patch testing on DermNet. The best way to make irritant contact dermatitis go away is to avoid contact with the irritant. Your skin can then recover. While your skin is recovering it is important to help keep it well moisturised so it doesn't get dry and sensitive again. Avoid using soap, as soap dries out your skin and makes it more sensitive. Instead, use a soap substitute such as aqueous cream or another moisturiser, which you can buy from the pharmacy or get on prescription from your GP. Wear gloves when you are washing up or shampooing your hair. Moisturisers (also called emollients) will help to rehydrate your dry skin and also provide a barrier for your skin so it becomes less irritated. You might need steroid creams to settle down the redness and itch. Sometimes you can't totally avoid the irritant because it is part of your work. If your contact dermatitis is related to work you should see your GP, as they may be able to lodge an ACC claim for you. ACC can help you and your employer find ways to look after your skin at work. If you can't totally avoid the irritant and it affects mainly your hands, you can protect yourself by wearing gloves, washing your hands with a soap substitute, and moisturising your hands often.